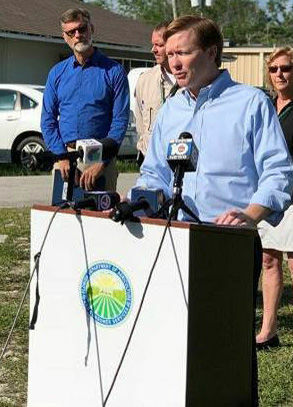 Agriculture Commissioner Adam Putnam announcing the findings at a press conference on June 5. Presence of scale adults on palm leaf. Three Oriental Fruit Flies were found in a trap in the Redland. Posted: Friday, June 8, 2018 11:00 am | Updated: 11:23 am, Fri Jun 8, 2018. Last time they invaded their devastation was over $30 million to local growers. State Agriculture Commissioner Adam Putnam said this week that eradication efforts have started after three Oriental fruit flies were discovered in the Redland. The fruit flies, which were last found here in 2015, are dangerous to the farming industry because they attack 400 different fruits, vegetables and nuts, Putnam's department said in a news release. The flies were discovered just west of Krome Avenue near 216th Street. “Just a few years ago South Dade had this same problem and we lost millions of dollars in business revenue. Between that, the continuing fight against laurel wilt that has been damaging the avocado crop and then losing much of last season to Hurricane Irma damage, and now possibly losing the season immediately following that to a quarantine, this community will struggle mightily. People could lose businesses, others could lose jobs. South Dade needs the county and the state and the federal government to be as proactive as possible to control the flies and limit a quarantine. Homestead Mayor Jeff Porter. The flies were found in traps monitored by the Florida Department of Agriculture (FDACS). The plan is for now to start an eradication program managed by the State. If three more male flies or a female fly is found, that could trigger a quarantine like we had in 2015-2016. It will take three life cycles (about 90 days) without a find to consider the area clear. It is important that property owners in our area comply with the requests from FDACS and the USDA so that the issue can be resolved as soon as possible. US Rep. Carlos Curbelo has stated, “The oriental fruit fly has had devastating effects on Miami-Dade County's agriculture. I worked hard in 2016 to ensure our growers got the federal assistance they needed during the last outbreak and will remain in constant contact with USDA to monitor recent pest discoveries,” . The Florida Department of Agriculture and Consumer Services has positively identified the presence of three Oriental fruit flies, Bactrocera dorsalis, in south Miami-Dade County. The initial fly was discovered during routine trapping, and additional flies were discovered during expanded trapping activities. The department, along with the U.S. Department of Agriculture, monitors more than 56,000 fruit fly traps statewide as an early detection network against exotic fruit fly introductions that threaten Florida’s agriculture industry. “We successfully eradicated this invasive pest, protecting Florida’s $120 billion agriculture industry, three years ago, and together with the U.S. Department of Agriculture we’ll implement an aggressive eradication program to do so again,” said Agriculture Commissioner Adam H. Putnam. The Oriental fruit fly has been trapped several times in Florida since 1964 with the most recent time being in August 2015, and each time it has been successfully eradicated. This species is considered one of the most serious of the world’s fruit fly pests due to its potential economic harm. It attacks more than 400 different fruits, vegetables and nuts, including avocado, fig, grapefruit, guava, loquat, mango, roseapple, papaya, peach, persimmon, Surinam cherry and white sapote. The fruit flies lay their eggs in host fruits and vegetables. To eradicate this pest, treatment is being conducted in a 1.5-square-mile area around the fly detections. This treatment consists of attracting male flies to bait which consists of an attractant, an insecticide, and a thickening agent. The flies are killed when they feed on the bait. The mixture is applied every other week to the upper portion of utility poles, trees and inanimate objects for a period of two life cycles of the fly (approximately 60 days) past the date of the last detection. A third life cycle (approximately 30 days) after the treatment is complete, and no additional fly has been detected, is also required to declare eradication will be declared. If you suspect a fruit fly infestation you should immediately contact FDACS-DPI helpline at 1-888-397-1517 and DPIHelpline@FreshFromFlorida.com – please do not bring produce samples with suspected fruit fly infestation to the Miami-Dade County Extension Service. “The significance of this pest can't be understated. It effects our producers, their retailers, and ultimately the end consumer. The impact of invasive pests on our local agricultural industry is a perpetual problem worsening each year. We need to keep pests like the Oriental Fruit Fly off our shores. The Dade County Farm Bureau actively advocates for thorough inspections of imports before being shipped and upon arrival, accountability for exporters, and penalties for noncompliance with laws that are already in place to protect our producers,” added Erik Tietig, President of Dade County Farm Bureau. Posted in News, Florida city, Homestead, Miami-dade on Friday, June 8, 2018 11:00 am. Updated: 11:23 am.